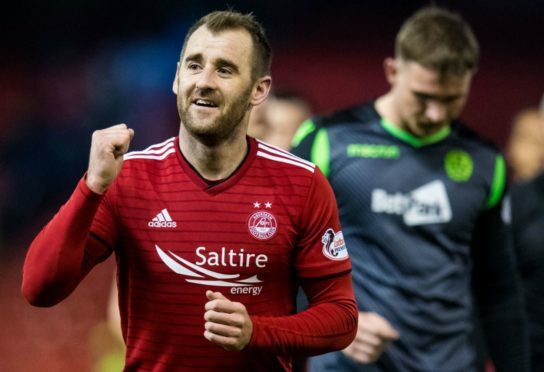 Aberdeen's Niall McGinn celebrates his sides win. So on a night when the stakes were high, and Derek McInnes had warned his players to put an end to their awful home form before the volume of criticism becomes so too, it was fitting that a man by the name of Lowe should look to flip the Dons’ fortunes, from a rare altitude. But as the first half wore on without any addition being made to Max Lowe’s early inadvertent steepler, the unease in the stands became palpable; the Red Army has seen this script too many times in the recent stuttering run. And so it was to nobody’s surprise when anyone who had assumed Aberdeen’s early lead would be automatically transformed into a win was proved to be wrong. The excellent Jake Hastie had been the lone threat to the Dons, and given their inability to repel the attacks of underdogs this season – only one clean sheet in their last 13 matches against sides starting in or below the bottom six – it was almost inevitable that he would, so heavily against the run of play, cancel out the opener. It could have been a blow exacting a heavy toll on the Reds, striking them in a tender area where they have absorbed excessive punishment. But the manner in which they dragged themselves from the canvas and set about the second half with the same punch as they had the first, was impressive. Motherwell may consider themselves unfortunate that, having already lost one goalkeeper to deep vein thrombosis, it took another to leave the field injured before the winning goals could be found, but given the disparity in shots attempted throughout the match it would have been harsher on the Dons had they not arrived eventually. Long overdue, and not a minute too soon.